I love getting questions from readers! Janet asked about the realities of cooking from scratch in the RV: What do we keep on board for equipment? How do we manage healthy meal preparation? What are some ideas and tips for buying organic or in-bulk on the road? 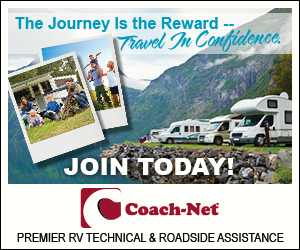 I’ll tackle the first question in this post and tell you about my RV kitchen and equipment. First off, we picked an RV with a reasonable food prep area. 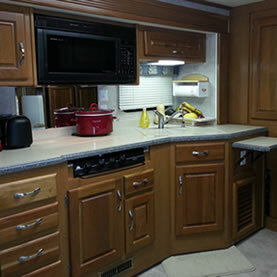 Many of the RVs we toured before our purchase were disqualified at first glance because their kitchens were just too small. 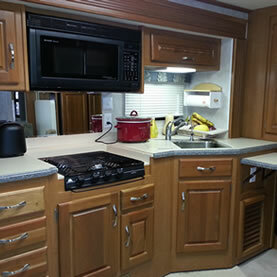 We’ve also seen fifth wheels with double the kitchen space, as well as a few newer larger motorhomes, but my RV kitchen is adequate and I’m satisfied with it. To get the most from my counter space, I’m constantly reconfiguring my work area. When the stovetop and both sides of the sink are covered, there’s lots of counter space, but the only time we use that configuration is when we’re rolling down the road. My stovetop stays covered when not in use, and I use that area like you’d use any kitchen work surface. An electric frying pan usually sits on top – it takes up so much less space than leaving the whole stovetop open for a one dish meal. If I need more space to chop vegetables I cover one side of my sink. 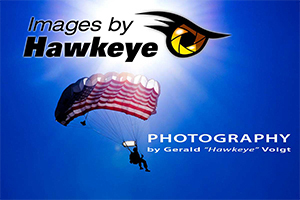 Depending on what I’m doing, at any time in the process any or all of the four removable surfaces may be in use. Equipment/appliances that always stay on my counter include a coffee maker and a toaster. When we’re rolling down the road they sit on a grippy mat. I just turn the coffee maker around so that the carafe faces the back wall (so that it doesn’t come flying out when we hit the inevitable bump). A handheld mixer is stored under an upside down colander next to two small mixing bowls in the cabinet over the sink. A large, deep serving bowl also resides in this cupboard. It doubles as a large mixing bowl on rare occasions when needed. I don’t have an oven under the stovetop. Instead, it’s a big open cupboard. It holds my four-quart Crock-Pot , salad spinner, popcorn popper, Ninja Chopper , assorted frying pans, a couple of saucepans, cutting boards, and all of my plastic storage containers. Our knives fit on the inside of the door in a knife safe. Honestly, it’s a mess in there, but until we get a shelf installed I’ll continue to make it work. Update: November 7, 2017 – My list of useful RV kitchen appliances has increased by two. Long after this post was written, I purchased an Instant Pot and fell in love with it. I use it for everything from beef roast to rice. And a couple of months ago I added an Air Fryer to my collection. I use it almost daily, sometimes more than once in a day. It makes the BEST oven fries and roasted vegetables, oven fried chicken, and even bratwurst. All my baking and roasting is done in our convection microwave oven. It took a little getting used to and now I love it! I’ll cover specific baking tips in another post, but address baking pans here. Round pizza pans make terrific cookie sheets. Muffin tins can be found at the six muffin size. Loaf pans, round and square baking pans and pie plates all fit beautifully. We have a four door refrigerator/freezer which is more than adequate for our produce-heavy cold storage. Finding space for pantry items is a challenge though. Canned goods go in the small cupboard under the kitchen sink and in the wall pantry. I store overflow items that we seldom use in a short, flat, plastic container under the bus. Snacks and plastic wrap, foil, and bags reside over the couch. Dish towels are in a dishpan in the dinette bench drawer. So there you have it – my kitchen after a year on the road. 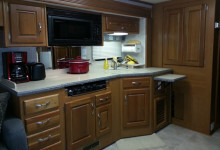 What are your must-have RV kitchen appliances? And where do you store them?